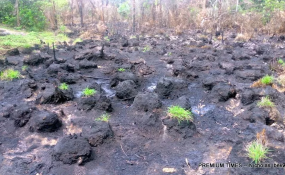 Contaminated Farmland at K-Dere, Ogoni land. The Federal Executive Council (FEC) has approved five more contracts for the clean up of Ogoni land in Rivers State. This was announced by the environment minister, Suleiman Hassan, while briefing journalists at the end of a seven-hour meeting of the council on Wednesday. The meeting was chaired by President Muhammadu Buhari. Mr Hassan said the new contracts, valued at N3.039 billion, are different from the 16 earlier approved and which sites were handed over to the contractors in January. "While the 16 contracts awarded earlier were within the ministerial tenders board, the five approved today is above the tenders board and that is why we presented them to the council," he said. The minister said the ongoing Ogoni clean-up exercise follows a United Nations Environment Programme (UNEP) report. Also, the governor of Kebbi State, Atiku Bagudu, who is the vice chairman of the National Food Security Council, said the council, chaired by Mr Buhari, submitted two memos which were both approved by FEC. Mr Bagudu said the first memo is in respect of intervention "for states that have been affected by conflicts and insecurity, where many have been displaced from their homes and some are living in Internally Displaced Persons' camps". The governor said whole support has been given in terms of accommodation, food and welfare. He said the food council considered the importance of helping those displaced to restore their livelihood, particularly agricultural activities. "Council approved the memo by Mr President and approved N8,558,529,755 for intervention in Adamawa, Benue, Borno, Plateau, Taraba, Yobe and Zamfara. "The beneficiaries are estimated about 69,872 people. The intervention includes the provision of fertiliser, seedlings, chemicals, poultry and animals to enable them to resume economic activity," he said. The Kebbi governor also said the council considered and approved the submission which originated from the National Food Security Council on states that have been severely affected by flooding. He said it is not an exhaustive list because the National Emergency Management Agency statutorily provides support to states that experience one emergency or the other. "Last year, there was an unusual amount of flooding in some states, about 14 of them, and the National Food Security Council considered the impact of that flooding on the agricultural sector, food security, animal husbandry and fisheries. "And so, today the council approved an intervention totalling N18,942,818,912.14. "Contracts would be awarded to 15 companies to provide seedlings, agrochemicals and fertilisers to 163,117 beneficiaries located in 14 states. "The states are Adamawa, Anambra, Bayelsa, Benue, Delta, Edo, Jigawa, Kebbi, Kogi, Kwara, Niger, Rivers, Sokoto and Taraba," he said. He also said as part of the work of national food security council, other interventions have been considered and are being worked upon by the beneficiary communities and also the livestock sector. He said the committee worked with the National Emergency Management Agency (NEMA) to draw up the list of beneficiaries.